The Standard of Ferret Breeding: Are We Damaging Ferrets For The Sake Of Human Wants? Let’s meet LUCA, the last universal common ancestor for all life on Earth. She existed three and a half billion years ago. Looking at this basic, single-celled organism, you’d never guess that one of her future generations would be a ferret. But guided by natural selection, evolution drove the characteristics of all animals to suit their environment. Then along came humans who manipulated both the environment and the breeding of plants and animals. So instead of organisms being best suited to their natural environment, some organisms have become best suited to the needs of humans. Long before humans had any concept of evolution or genetics, they chose to replant the better plants, feed and look after the better animals. Then after Mendel made some incredible discoveries about the interaction of genetic code, humans have been making much more deliberate and informed choices when breeding organisms. Where Did That Ferret Come From? Ferrets are widely believed to have come from the European polecat, more than two thousand years ago. Since then, every choice about which ferret to keep, feed, and allow to breed, has had an effect on what ferrets are like today. Some of these decisions might have been based on having happy, healthy ferrets. But other factors were also a big influence, like how good at rabbiting they were, or if they came back or ran away from their owners. Some characteristics had very little or no influence on breeding choices, like how well a ferret could survive in the wild. This has resulted in the loss of instincts and other traits that would enable a modern ferret to survive without a human taking care of them. While some ferrets today are bred and used as workers, most ferrets are now bred to become pets. And because color and fur length most dramatically affect ferrets’ attractiveness, these qualities can have a much stronger influence in pet selection than genetic defects that might not be visible or may present later in life. All organisms have some level of faulty or underperforming genes in their gene pool. Pets bred for particular characteristics, like Dalmatian dogs, have substantially more genetically-influenced illnesses than wild animals. 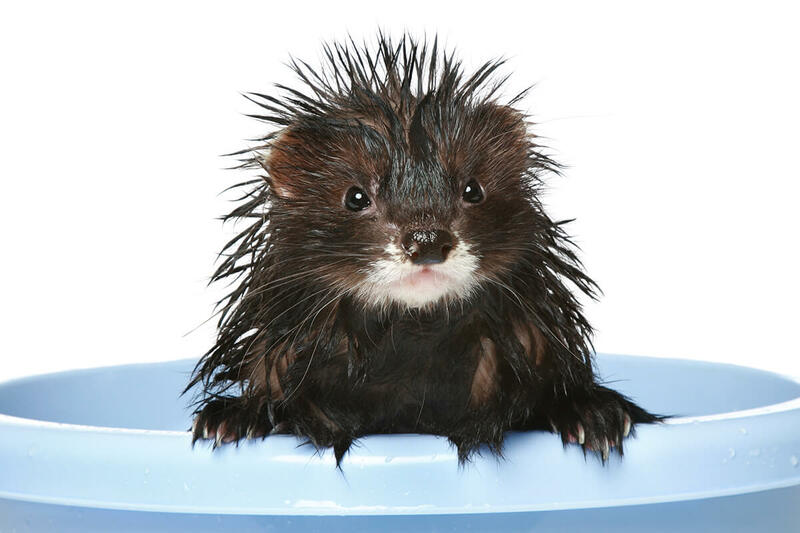 But out of all pets, ferrets may have the worst reputation for a faulty gene pool. There are a number of measures that can be taken to improve the ferret gene pool and as a result the quality of every ferret’s life. But to understand what can be done and the limitations that are faced, a bit of genetic knowledge is required. The ferret’s body is made entirely out of cells. Each cell contains a set of forty chromosomes, six less than humans. Every one of these chromosomes looks like a pair of chains that are linked, sometimes near the middle or sometimes near their ends. But every set of chromosomes, in all of the ferret’s cells, are the same. One of the pairs of chains in each chromosome came from the mother, the other from the father. If you zoom in really close to one of these chains, you’d see that it is an extremely long and thin string of a molecule. This is the DNA of the ferret’s cell. What is really interesting about chromosomes and DNA, is that if you start at the point in a chromosome where the two chains join, and count down both chains for any particular number of links, you’ll always end up at a location that has the same function as its matching links on the other chain. 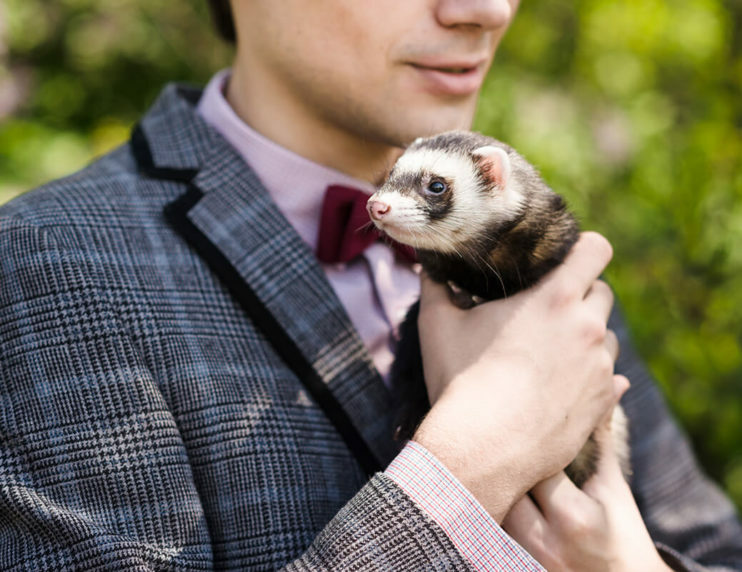 These links might determine any aspect of what your ferret looks or acts like. The links in the DNA that can have noticeable effects on your ferret are called alleles. And this term refers to the pair at matching positions on their respective chain. These alleles are just a series of instructions for how to make a protein. Some instructions make the protein more efficiently than others. Other instructions in a pair might make a different protein, or just garbage. You’ve probably heard of dominant and recessive genes or alleles. And it can sound complicated, but a metaphor can help. You can think of these little protein factories like paint tubes. If you’re mixing an almost clear-yellow tube, with a very bright yellow tube, you’ll get a very bright yellow. You’d call that brighter tube of yellow dominant. But in a different ferret, at that location in the chain, you might have one link with the same bright yellow tube, and its pair with a black tube. When you mix those paints together, you’ll just get black. So now that same bright yellow tube looks recessive. Other tubes of paint are all solid and blocked up. Those ones look recessive to everything else. That’s because their proteins are junk. But often it takes more than one allele to have an effect. Let’s consider the early greys. The easiest way to think about this is to consider two different locations on the chain. One location has an allele that makes special clear boxes that enable you to see what color is inside. The other one makes the color melanin. In the early greys, while they are young, both the alleles work fine. There’s plenty of boxes filled with color and you have a colored ferret. Then something about the color-making allele means it runs out of color early, and while the clear boxes are still there, there’s no color in them. So now your darling goes from colored to white. But something different happened with the blaze and panda ferrets. Early on in their fetal development, those clear boxes didn’t make it out to all the locations where they should have on the ferret’s skin. So when the color comes along, you don’t get to see it where the white fur is, because those clear boxes, those cell types, don’t exist there. The really sad thing is that those clear boxes don’t exist in an important part of one or both of the ferret’s ears either. And it turns out that these clear boxes do more than hold color. They enable your ferret to hear. That’s why, in the now-famous study from 2014, when Dr. Stéphanie Piazza et al. studied the “prevalence of deafness and association with coat variations in client-owned ferrets,” they found that every one of the 27 panda and blaze ferrets was deaf. This compares terribly with the 63 ferrets that didn’t have white markings, all having intact hearing. These findings are directly related to other issues, well known in the ferret breeding community, known as neural crest and Waardenburg syndrome. Other symptoms of these conditions are a wider space between the eyes and cleft palates. This study was preempted by Dr. Judi Bell, back in 1998, when she identified a correlation between panda and blaze patterning with genetic defects, including deafness and cleft palate. In her speech at the American Ferret Association (AFA)-sponsored “Medical Management of the Ferret,” she recommended that these traits not be bred for. Since then, breeders have ignored that advice and produced a popular trade in these markings. Other markings like dark-eyed whites also have this issue, and because albinos don’t have the pigment to reveal if patches are missing out on the transparent-box cell, some of them may also suffer from this genetic defect. This is a bit like painting white panda markings on white paper. It can be hard to see if some of the paper is missing paint. Understanding how alleles interact to have an effect on something like size or personality is extremely difficult, because there are so many contributors and interactions. But for some inheritable diseases, only one faulty allele is required. But because the faulty gene in this allele-pair is likely to be recessive, we won’t see the effect until a ferret is born with both genes faulty for that allele. So testing to see which genes they have is a great solution. Testing for faulty genetics has become routine for responsible dog and cat breeders because the cost of testing has fallen so dramatically. Because it can lead to healthier, happier, and longer-living ferrets, it should be a part of the breeding selection process for ferrets as well. But as a community, we’ve let our ferrets down. The British Ferret Society has a breeding guide that barely touches on genetics, saying only, “Also making sure that the ferret isn’t deaf. All these can be signs of bad breeding and bad genetics.” The British Ferret Club doesn’t mention lineage in relation to deafness or genetic defects. 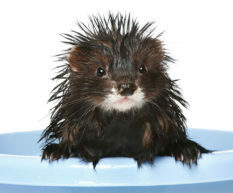 Possibly worst of all is the AFA’s Ferret Breed Standard which begins with the honorable intention of “promot[ing] the breeding of healthy ferrets who conform to the structure of what the ferret was meant to be” but then end with tight definitions of various ferret types which require deliberately limiting the gene pool to create. This standard fails to mention deafness and simply states, “reputable breeders are mindful of breeding for genetically sound characteristics and should always breed for physical characteristics that are consistent with M. putorius.” Unfortunately, the Australian Victorian Ferret Society copies the AFA standard word-for-word. 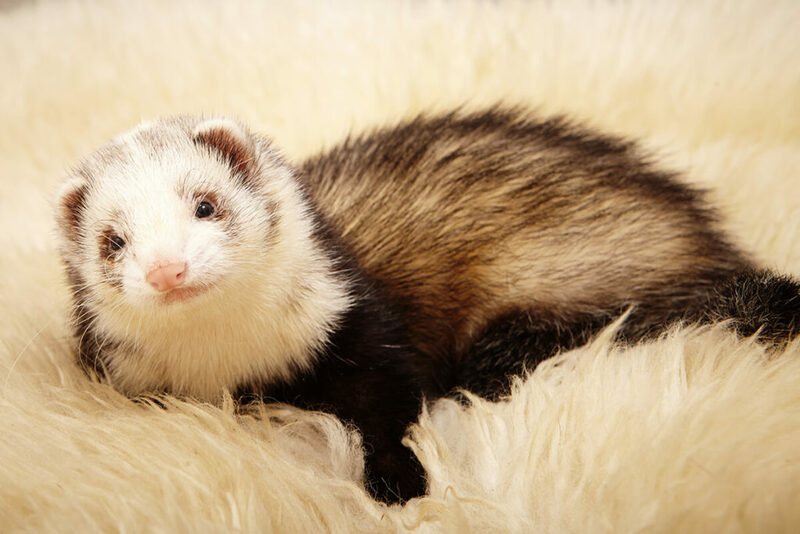 With ferrets known to suffer from many diseases that are much rarer in other animals, we can be confident that there is a genetic cause underlying them. This includes cystic kidneys, cataracts at a very young age, lymphoma, adrenal disease, and insulinoma. Compared to these, deafness might seem mild, but it is known to cause behavioral problems such as anxiety and aggressiveness. The ferret societies have let us down, so instead, maybe we should look to the universities for our standards. In 2011, the University of California Santa Cruz embarked on an ambitious journey to map the ferret genome and it is now publicly available. The University of Sydney started a database of veterinary records, and then with six other Australian universities became a part of the Royal Veterinary College of London’s broader Vet Compass program. Or we could look at the inspirational work of Barbara Grafton Packard, who, in the mid-1980s recognized the power of genetics and began the Institute of Genetic Disease Control for tracking the relationships between hereditary lines and illness. Her legacy has since formed a part of the Orthopedic Foundation for Animals which continues to develop the database. Whichever way the community of ferret owners and breeders go, some things are clear. We need a useful ferret breeding standard that works to reduce the number of genetic illnesses suffered by our ferrets. We need to work together, possibly with existing databases, to record the heritage and illnesses of our ferrets. And we need to use this information to guide our pairing choices. 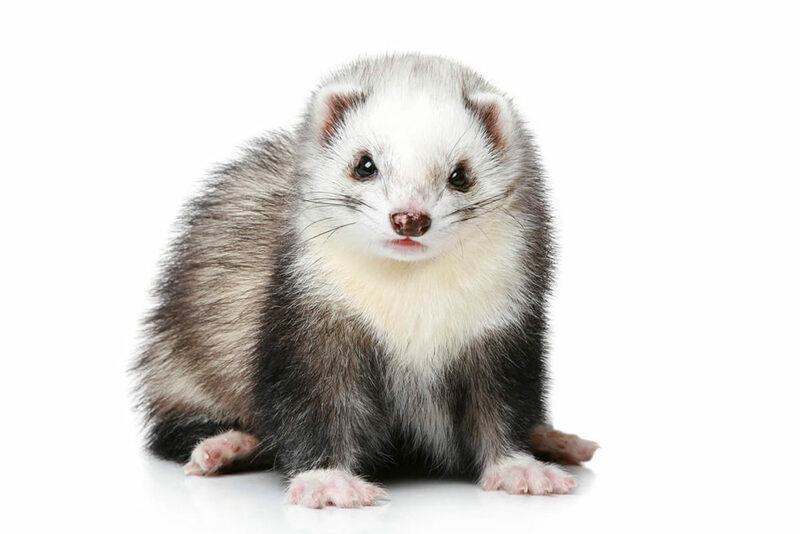 And finally, we need to work together to update our many ferret advice resources to raise awareness of genetic disorders, their characteristic, and indicators. This way, the public will put more pressure on breeders for healthy ferrets and less pressure on them for cute markings.